What's in a Web Name? Adding content in Plone is done placefully,*which is to say that you must navigate to the section of your Plone website that you wish the new content to reside before you use the **Add New . . .* drop-down menu. You can of course cut, copy, and paste content items from one section to another if necessary. An Event is a special page-like content type specifically for posting information about an event (such as a fundraiser, barbecue, etc).Â This content type has a function which allows the site visitor to add the event to their desktop calendar with either the iCal or vCal standard. This includes applications such as: Google Calendar, Outlook, Sunbird and others. To add a single event to your calendar, click on the vCal or iCal links next to the "Add event to calendar" text in the main view of the event item. 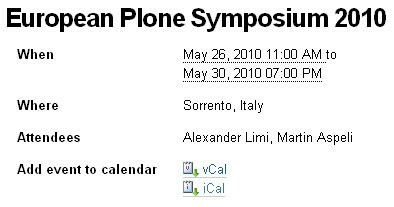 From Plone 3.3 on you can also get all the events in a folder in one go (currently only available in iCal format). To download the iCal file, append @@ics_view to the end of the URL of the folder that contains the events. 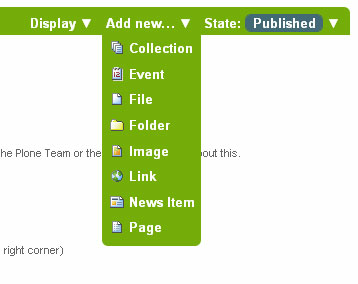 For example, if you want to get all the events into the events folder in the root of your site, go to http://example.com/events/@@ics_view. The Description is just plain text, without any form of mark-up. This is to keep it inline with Dublin Core standards.